I've loved every single figure release so far in this Bandai Tamashii Nations Star Wars line. 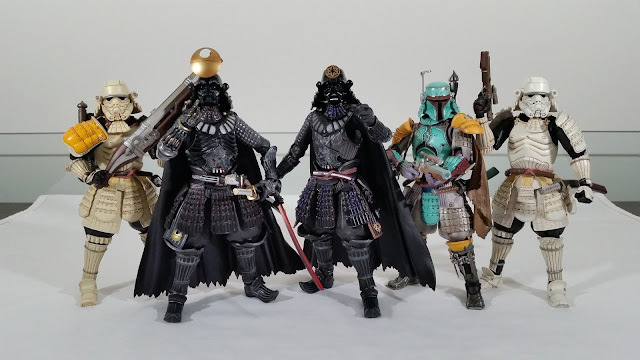 Based on the Japanese feudal costumes that originally inspired the iconic Star Wars designs, these figures have a fantastically unique look to them, and have great build quality to boot. 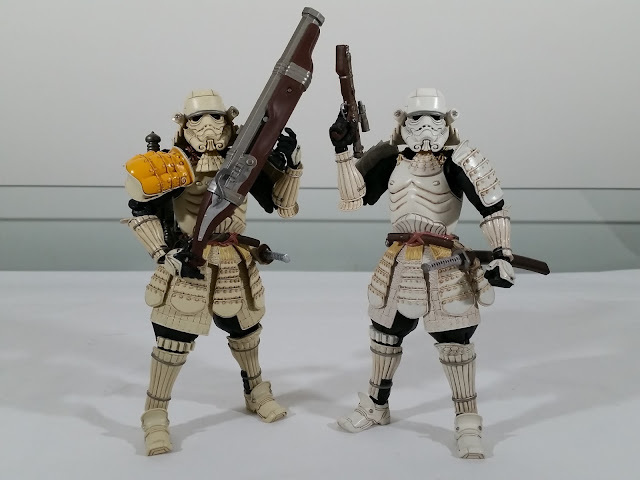 The most recent release is the Sandtrooper, which shares much of the same design as the original Stormtrooper, but with some nice little unique changes. The packaging is the same classy, very collector-friendly style of the earlier releases. Bandai simply know how to sell these with great artwork and photos on the box. All the accessories are packaged nicely, and have some great touches. 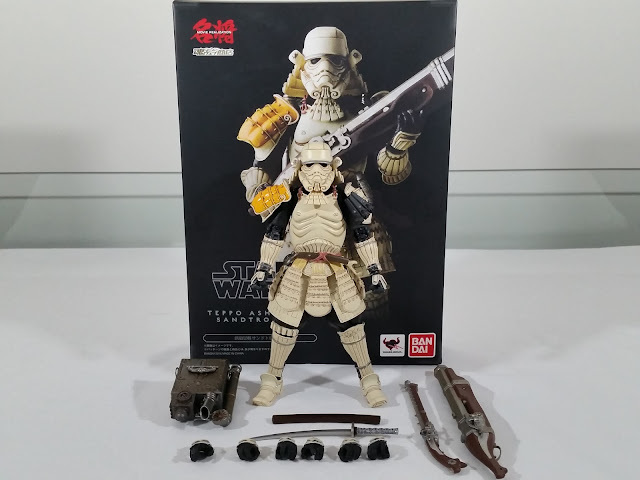 It comes with two large rifles to mimic the large rifles carried by Sandtroopers in the movie. It also comes with the standard katana and sheath that you attach to the belt. And then of course there is the amazingly detailed and painted backpack. 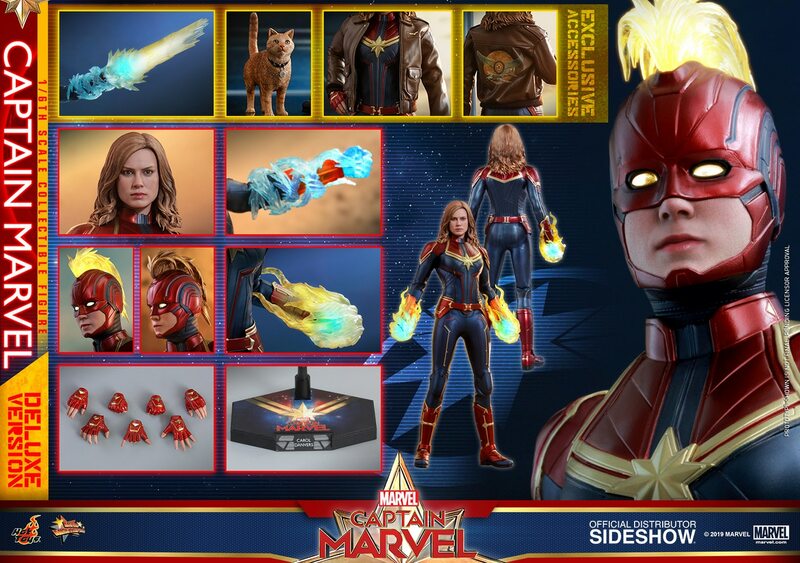 The assortment of swap out hands all cater for holding the accessories and other poses, so all around a nice package. The figure itself has some nice modifications specific to the Sandtrooper. The yellow pauldron replaces the right shoulder armour and is nicely painted. The armour, as with the other figures, is adjustable to support a wide range of articulation. The neck area also has some additional paint detail in the plastic strings that tie the armour pieces together. The left armour is also slightly modified from the standard Stormtrooper, with a more rounded design. And of course there's the obligatory leather pouch across the front of the shoulder too. It's molded plastic, but looks nice with the molded detail and paint. The backpack fits onto the body via a peg that slides in fairly easily and allows for a bit of rotation to align the backpack how you like. I really love the molded detail and dirty metal paint app on this piece. It's instantly recognisable as the Sandtrooper backpack, but has a great unique quality to it. All posed up, the Sandtrooper looks amazing. I was going to get two, as I already have two Stormtroopers and have two Royal Guards on the way. But with other Stormtrooper variants on the way, I figures I'd save the money and get at least one of each trooper variant.